Moor House's potential as a research site was recognised through pioneering ecological and meteorological studies in the 1930s and 1940s, before it became one of Britain's first National Nature Reserves (NNR) in 1952. It was the main UK uplands site for International Biological Programme research between 1964 and 1974. A wide range of upland biological and hydrological issues have since been investigated, especially the impact of land use change, climate change and the deposition of pollutants on the biodiversity and functional processes of the blanket peatland and streams. Moor House is now a flagship Environmental Change Network (ECN) monitoring site. The long-term data is a valuable resource for detecting change and assessing against experimental work, providing baseline continuous monitoring of a wide range of variables. The site is thus an ideal platform for a range of both short and long-term experiments. 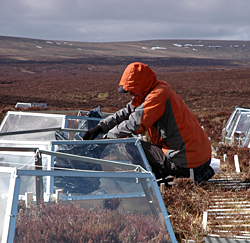 Moor House, an upland site of 74km2 on a large area of blanket peat bog in the north Pennines, is suitable for a range of upland research initiatives, particularly investigations into peatland dynamics and processes. CEH manages the ECN site, meaning extensive data covering two decades are available. Habitats include exposed montane summits, extensive blanket peatlands, upland grasslands, riparian wetlands and pastures, hay meadows and deciduous woodland. Altitude ranges from 290m to 850m. The Trout Beck, which has its catchment within the Moor House National Nature Reserve, is an ECN Freshwater Site. The geology is alternating strata of Carboniferous limestones, sandstone and shales. Blanket peat covers 90% of the catchment with thin organic soils towards the fell tops and small areas of limestone and alluvial soils. The vegetation on the gently sloping eastern side is dominated by cotton grass (Eriophorum), heather (Calluna vulgaris) and Sphagnum moss, although the steeper western side has more variable soils and vegetation. The climate is "sub-arctic oceanic" with a mean annual temperature of 5.8°C and average annual precipitation of 2065mm. Facilities include a fully automated meteorological station (and back-up manual weather station). The Environment Agency maintains a 15-minute flow for the Trout Beck that contributes to the ECN database. Terrestrial measurements have been undertaken by the ECN at Moor House - Upper Teesdale National Nature Reserve since late 1992. Freshwater measurements have been undertaken on the Trout Beck at Moor House since the beginning of 1997. 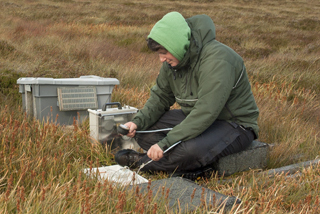 These include continuous monitoring of climate (hourly), atmospheric deposition chemistry (weekly), soil solution chemistry (2 weekly), soil bulk chemistry (5 yearly), river chemistry (weekly) and associated flow (hourly), annual monitoring of vegetation and more frequent measurement of a range of other biological variables. Measurements follow clear protocols that are also carried out at 11 other ECN sites situated in a range of habitats across the UK that also provide supporting data. If you wish to discuss specific opportunities to develop research at Moor House in collaboration with CEH, please contact Don Monteith (ECN coordinator) or Rob Rose (Moor House site manager).